8 nights in privately owned comfort class Bed & Breakfasts (casas particulares), double occupancy. Private transportation in air conditioned bus. 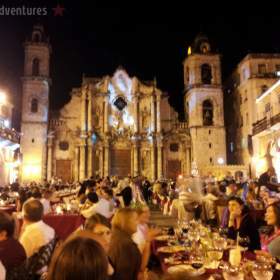 This tour complies with the general license category Support for Cuban People for individuals (515.574). The tour provides the basis and support for your compliance with the law. Special arrangements may be available for travelers who prefer to travel under the People to People category. Included Activities Old Havana half-day guided walk, Visit to Jaimanitas community art project, Visit to Las Terrazas eco-village and explanation of their Rural Economy Project, half-day Vinales cultural/scenic trek including Tobacco Farm visit, Cooking class & dinner, organic farm visit and tour, Playa Giron museum & documentary film, Korimakao Project, Cienfuegos orientation walk, Che Guevara Mausoleum, Manaca Iznaga Sugar Plantation visit, Walk to Javira waterfall, Walking tour of Trinidad historic center, introductory group Salsa Lesson. All breakfasts, 5 lunches, 4 dinners. Airport arrival transfer. Private local Cuban guide throughout. The purpose of this itinerary is to give you an idea of the types of activities you will engage in during this tour of Cuba, however, it may change based on factors such as season, availability, and weather. Tour requires a minimum of 2 passengers to depart. Please do not book international flights to Cuba until the tour is guaranteed. 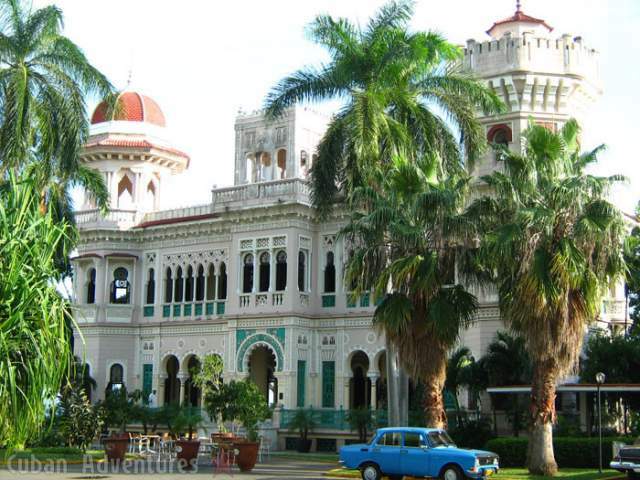 This tour is a fantastic introduction to Cuba that gets you out of Havana so that you can see what many visitors to Cuba do not, that Havana is not Cuba and Cuba is not Havana. Visit the rural Viñales Valley with its gorgeous landscapes and friendly locals, stroll the romantic sea wall in Cienfuegos, a city with a French influence. Spend time in Trinidad, a traveler favorite, with its colorful buildings and cobblestone streets. 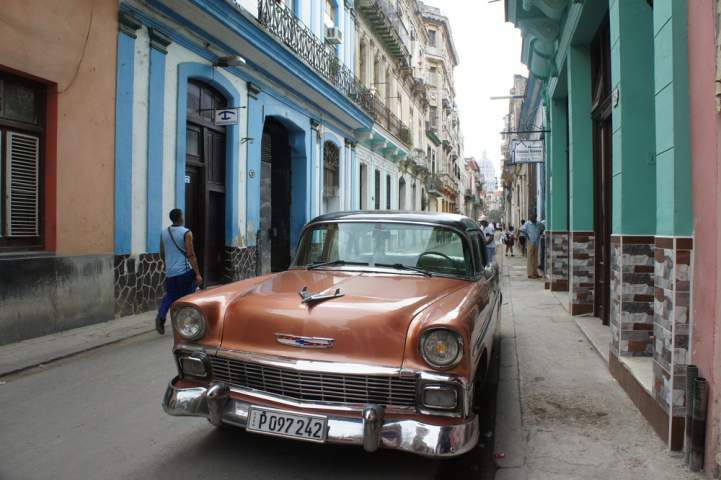 The focus on this tour is to learn about ordinary life in Cuba, and how individuals are impacted by the government, social structure, and the embargo. You’ll learn about Cuba’s proud and patriotic culture, its tumultuous history, its thriving arts scene, and its burgeoning entrepreneurial spirit. You’ll meet with locals from different walks of life and learn about family life, favorite pastimes, the school system and the workplace. You’ll learn about the challenges that Cubans face in getting access to necessities, comforts, and luxuries, and the interesting and often ingenious ways they've developed of "resolviendo" (resolving) to get what they need. Welcome to Cuba! Today we arrive in Havana and settle into our B&B accommodations. We’ll meet the local tour leader and have dinner together at a local paladar (privately owned restaurant). The best place to start any Cuba experience is in the Old City. In the morning we take a guided walking tour of Old Havana. In addition to visiting historical sites, we will learn about the impact of the dual-currency economy by visiting commercial centers, where goods are purchased in CUC, and ration or peso stores, where goods are purchased in CUP. We end our day with a visit the fishing village of Jaimanitas and the home of the famous artist Jose Fuster. Fuster has made his entire home, and much of the surrounding neighborhood, into an artwork using tiles in mosaic forms. Viñales is situated in one of the most picturesque parts of Cuba, among the limestone pincushion hills (mogotes) of the Pinar del Rio province. On the way to Viñales we visit in the community of Las Terrazas where we will meet up with our local community leader who will share with us some insight into how the local society works. 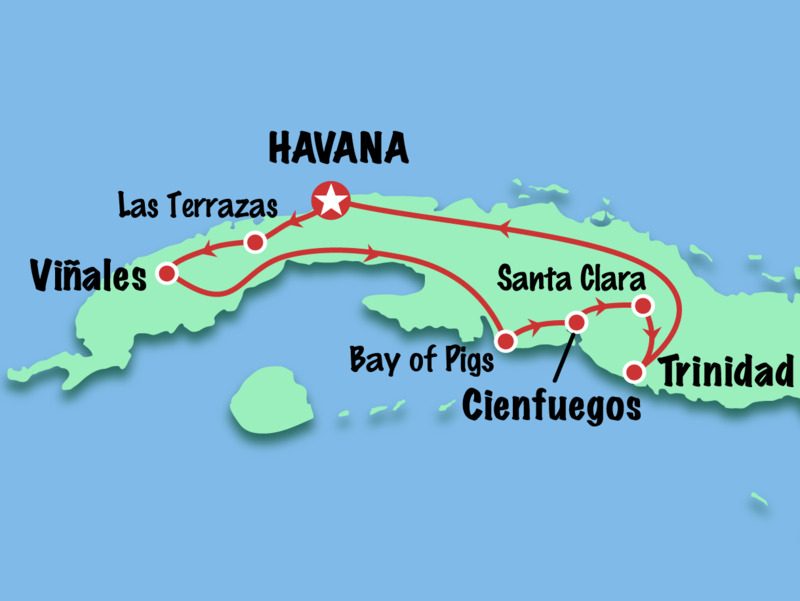 We will reach Viñales in time to tour an organic farm and learn about sustainable farming in Cuba. Here we meet our local farmer and his family who will show us around the organic farm and explain to us the methods used to cultivate crops without the use of pesticides. With the beautiful sunset as our backdrop, we will enjoy a deliciously fresh and diverse meal prepared by the family, a truly authentic farm-to-fork experience! Today we spend the morning learning the tradition of Cuban cigars from a farmer and expert cigar maker. Get an insight as to how the communist system works, how much tobacco they will keep, how much produce they give back to the government, how they make ends meet! You will learn about the process from tobacco planting to rolling the final cigar. In the afternoon we learn to cook Cuban-style with a cooking demonstration of platos tipicos Cubanos like congri, potaje, garbanzo soup, ajiaco, and flan. Fun to cook, but even better to eat! Today we depart for Cienfuegos the Pearl of the South, a city founded by the French, which lends it a distinctly European flavor, with a wide Parisian-style boulevard and elegant colonnades. We drive along the picturesque Bay of Pigs where today there is a museum here that recounts the events of this conflict which resulted in the first defeat of a U.S backed take-over in Latin America. Time permitting we will stop for a swim along the way in the vivid turquoise ocean or take a dip in a sink hole which resembles a huge natural tropical fish tank. Make sure to pack your swimsuit! The colonial city of Trinidad is home to numerous churches and many beautiful colonial buildings. We begin with a cultural tour of Trinidad. The city had some very wealthy residents in the 18th and 19th centuries who made fortunes out of the sugar industry, and some of their houses have been made into museums. Visiting these will give you a fascinating insight into their lifestyle during that time. On the other end of the social scale were the African slaves, who had a profound influence on the city's culture, music, and religious beliefs, and as part of our walk around the town, we drop by an Afro Cuban temple to Yemaya, an important figure in the Santeria religion. In the afternoon we visit a private dance company and learn about the cultural and social importance that dancing has to Cuba, and take a group salsa lesson in their private dance studio. Nightlife in Trinidad is probably the most accessible and intense in all of Cuba, with numerous live music venues and many dance performances every day of the week, all amongst the enchanting setting of old colonial buildings and the cobblestone streets. Today we will learn about the history of the area and the local industry and biodiversity as we take a short hike to a waterfall outside of the city. On the way we stop in a very simple campesino’s home to learn about life in the rural areas of Cuba. After cooling off in the natural pools, we return to Trinidad where you’ll have the rest of the afternoon to relax and explore. For dinner tonight we have a special meal (maybe on the beach!) with live music and a delicious array of Cuban specialties. On the way back to Havana we first pass by Manaca-Iznaga plantation in the Valle de los Ingenios where we will learn more about Cuba’s slave trade. A 147 ft tower was built here to look over the slaves as they worked. Continuing onwards, we stop in at the town of Santa Clara, a key city in the Cuban Revolution. Upon entering Santa Clara, we will see the iconic statue of Ernesto Ché Guevara, built to commemorate his death and that of the revolutionaries who died along with him in Bolivia. We will have our lunch at a small family farm near Santa Clara and head back to Havana where we will have some free time to freshen up before our farewell dinner, and of course, one final fun-filled night of music and dancing! Say good-bye to your guide and driver as you head home with your memories (and maybe a cigar or two!). We hope you will return soon! PLEASE NOTE: Travel times may vary. Times shown include stops. Prices start at US$1600 person. Optional Single Supplement US$285. We welcome solo travelers! You don't pay a single supplement unless you want to guarantee your own room. Read more about the single supplement. We require a US$400 per person non-refundable deposit to reserve your place on the tour. The remaining balance is due 60 days before the tour departs. Tours can be booked up to 10 days in advance, full amount would be due at booking. Note: Insurance is included in airfare for direct flights to Cuba from the U.S.
Roundtrip flights from Miami to Havana (including medical insurance): US$200-300. Read more here.